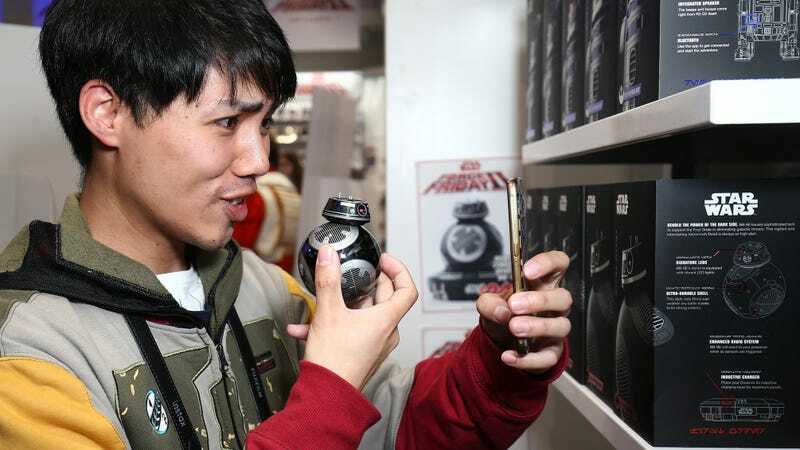 Fans upset over the introduction of Porgs to the Star Wars universe better grab their inhalers, because Force Friday II—the holiday where you buy special Star Wars stuff, as opposed to all the regular Star Wars stuff you buy on other days—has already begun in Australia. That means that the “brand new addition to the Star Wars universe” teased by Disney and Lucasfilm in anticipation of the annual marketing event has been revealed, and it’s—dare we say it?—pretty cute, in a Hot Topic sort of way. Meet BB-9E. BB 9-E is just like BB-8, the rolling robot who stole everyone’s hearts in The Force Awakens. He’s a droid whose magnetic head perches atop a rolling spherical body, and he makes adorable chirpy robot noises. He is also evil, as you can tell by his Goth-friendly black-and-gray colorway. We don’t know why BB-9E was invented, but we do know that he comes in a $150 rolling toy incarnation known as a Sphero, a $10 Funko Pop! version, and a teeny lil’ plush for $7.